Bosses at the transport firm say investing in staff is essential, but critics say Edinburgh residents deserve 'more tram building than team building'. Staff at Edinburgh Trams enjoyed team building events at a City Council owned rock climbing centre at a cost of almost £5000, according to expenses figures released by the scheme’s management. Bosses also paid a “highly motivational speaker” £1762.50 to address staff at the events in April. Edinburgh trams bosses published full details of their expenditure this week, after saying they were “committed to transparency of information”. As well as the team building event, the document reveals the firm spent £6432 on membership of four professional bodies, £8083 on flights since and £1,361.26 on taxis since April this year. Bosses say the costs are justified as an investment in staff, highlighting the dedication of workers during a difficult financial period in which they have forgone bonuses. However, a number of Lothians politicians have now expressed concern about the organisation’s spending priorities, with Lothians Tory MSP Gavin Brown saying Edinburgh residents would far rather see “more tram building than team-building”. 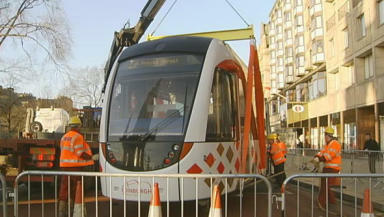 Edinburgh Trams Chief Executive, Richard Jeffrey, told STV News: “I make no apologies for investing in my team. “The staff here are the lifeblood of the organisation and investing in them means investing in the right people to manage what is a complex and difficult project. Last year for the first time in the history of Edinburgh Trams, we had a briefing day which we held on an Edinburgh Council owned site. “Given where we are in terms of evolution and forward planning, it was very important to have the whole team together and the cost per head for this was £36. If you look at all team workshop activity across the organisation, the total cost is £54 per head for the whole year including transport and overnight accommodation. However, Gavin Brown MSP said: “In this difficult economic climate it is vital that every pound of public money is spent wisely. Lothians SNP MSP Shirley-Anne Somerville, an outspoken critic of the trams scheme, added: "I would certainly query a number of the expenses incurred by TIE, but my real problems with the Trams project run much deeper - right back to the original business case. “Crucial decisions on the future of the Trams will be made in the next month or two, and TIE need to put much more information out into the public domain to allow the people of Edinburgh to make an informed judgement on what should happen next". It follows concerns over the financial state of the project. Edinburgh Trams remains locked in a legal battle with contractor Bilfinger Berger and in June it emerged the line could be cut short amid continuing fears over spiralling costs. A report to city councillors revealed a series of contingency plans were being considered which could see extra money borrowed to get work restarted. Officials have also been considering axing the German contractor or opting for a “phased delivery”, which would see the line initially open solely between a depot near Edinburgh Airport and Haymarket. Estimates suggest the project is currently facing cost overruns of £50m.